Give the Gift of Exploration! Starting today, November 13, 2017 through January 7, 2018, the Explorer Team is thrilled to give more opportunities to explore San Diego cultural gem: Balboa Park. 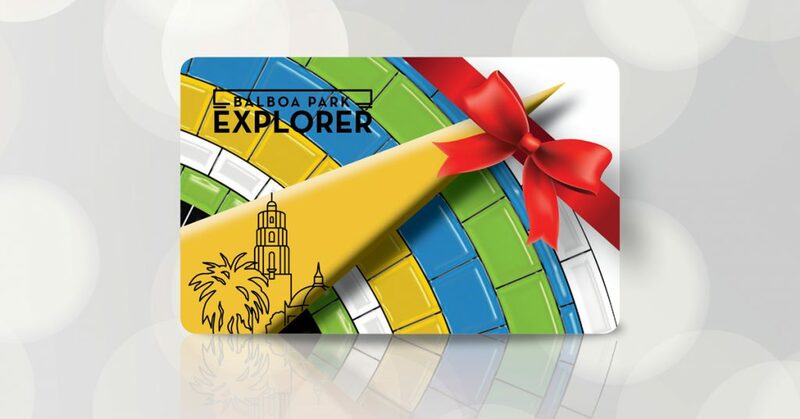 Current Annual Passholders will receive two Balboa Park Explorer One-Day passes with each Annual Pass Gift Voucher purchase. Balboa Park Explorer One-Day or Multi-Day pass purchasers who aren’t current Annual Passholders are invited to credit their passes towards an Annual Pass. * This is a great way to see if an Annual Pass is for you! We’ll also be at Balboa Park’s December Nights, December 1-2, 2017! December Nights is celebrating its 40th consecutive year and we’re so excited to be a part of the festivities! Two nights of beautiful lights, music, performances, tons of activities and all that amazing food make for lots of great San Diegan memories! Be on the look-out for our booth in the Palisades Lot. We’re giving away chances to win two Balboa Park Explorer One-Day Passes (it’ll be great for those out-of-town guests). Questions about any of these offers? Contact our Explorer Team. *Not valid for select events, special exhibitions and programs. IMAX is available at the special price of $9.95. Before visiting a museum, please contact the museum for information on additional events, special exhibitions, and film costs. Offer valid for current Balboa Park Explorer Annual passholders, on annual pass purchases made between November 13, 2017 and January 7, 2018. Passholder status will be checked prior to receiving complimentary tickets. Complimentary tickets will be sent to primary purchaser. Maximum four (4) complimentary Balboa Park Explorer One-Day passes per purchaser. One-Day and Multi-Day Pass credit must be applied within one week of first use. Apply credit at the Visitor Center. Rules and restrictions apply.